Hanging on the wall was the mosaic of the Last Supper that Christian wanted to see. In fact the version that intrigued him the most. Judas holding a small box in his hands, looking away from Jesus and his disciples. This cannot be a coincidence! I wasnt searching for this painting, and right now I just know that this discovery has something to tell me. I am really close to the conclusion; I can feel that about everything. The only thing standing in my way is a group of tourists who will not move on, but I am not going to let them stop me. They have had their moment; I want my answers now. God meets God helps you to remember what we all have been searching for through the centuries. It opens your eyes to see something you have never been allowed to see before: the secret of our existence on Earth. The book gives answers why we live in separateness, why failure and rejection are our biggest stumbling blocks and where our desire for unconditional love is based upon. No new wisdom, or dogmas just acknowledged symbols, which, form the pieces of the puzzle that only the soul can complete. Everything has a reason and nothing happens by coincidence. If you feel you are ready for the truth, to remember who you are and where your soul path is leading do, be prepared: afterwards there is no way back. 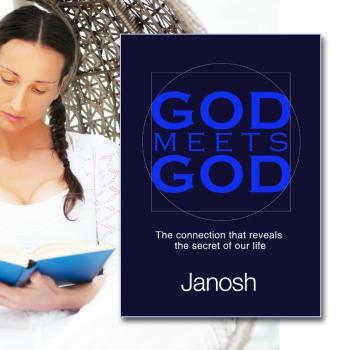 In his book Janosh invites the reader to take a journey through different lives, worlds and times. The theme quickly develops: the experiences of two individuals who are destined to meet one another and to change the world. A series of strange visions, emotional trials and violent confrontations are needed to bring the two together and when the meeting finally approaches, it turns out that fiction and reality are no longer distinguishable. The story becomes reality, to the point when it is not possible to realize who holds the destiny of mankind in his hands. Biography: Janosh is well known for his unique art, which is well received in the spiritual world. It is more important what is does to you than how it looks. Extraordinary things happen when you make contact with it, that has been proven many times. Although its not possible to explain, it has become the most normal thing in the world, when people take part in his sessions that their lives change completely. Suddenly they are able do things they always dreamt about. As well as personally or as in the role of the author, Janosh allows you to see that Sacred Geometry upon which his art is based, has a much deeper meaning. It brings us in contact with our sub consciousness, which houses our soul and where all the answers about life and ourselves are stored.